Bert Grimm started hanging around tattoo shops in Portland Oregon when he was about 11 or 12 years old, and the shops of Sailor Gus, Sailor George and Charlie Western became his home away from home. 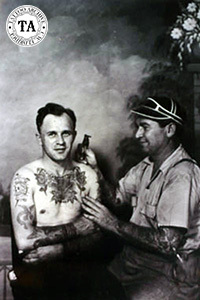 Bert was given his first tattooing outfit in 1912 and for the next 70 plus years Bert Grimm was a fixture in the tattoo world. Early in his career, Grimm spent a season with the Buffalo Bill Wild West Show. Throughout the years he operated shops in Chicago, Honolulu, Salt Lake City, Las Vegas, Seattle, Los Angeles, Long Beach, St Louis, Portland and Seaside Oregon, and China. Bert worked with some of the greats in the business, including, Domingo Gulang, Charlie Barr, Tatts Thomas, Red Gibbons, Walter Torun, Bob Shaw, and Col Todd, to name a few. Bert is probably best remembered today for the shop that he operated at the Nu Pike in Long Beach, CA from the 1950s to the late 60s. The Nu Pike was a large amusement park that goes back to 1897 and was home for dozens of tattooists. Bert Grimm's World Famous Tattoo was historic. It was one of the oldest continuously operating tattoo shops in the continental United States, where generations of sailors got tattooed before shipping out. Bert was inducted into the Tattoo Hall of Fame, which was then located at the Lyle Tuttle's Tattoo Art Museum at #30 Seventh Street in San Francisco. 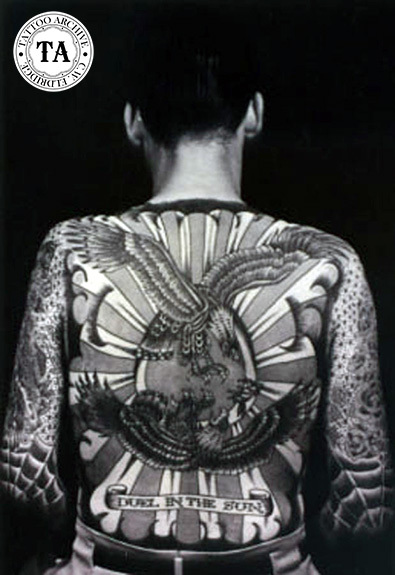 The photograph of the back piece seen here shows one of Bert's masterpieces as worn by Lyle Tuttle. Bert retired in the small Oregon town of Seaside in the later years of his life. He was not able to stay away from the tattoo business so he set up a small tattoo shop in his home. In a letter written to Paul Rogers during this time Bert stated that he did about 10 tattoos a week out of his house. Today the Pike is only a memory but I am glad to say the Bert Grimm’s tattoo shop located at #22 Chestnut Place, which was in jeopardy of becoming part of a Long Beach condominium development, was purchased in March of 2004 by Kari Barba and two silent partners. Barba turned part of the shop into a museum and continues operating it as a tattoo shop.